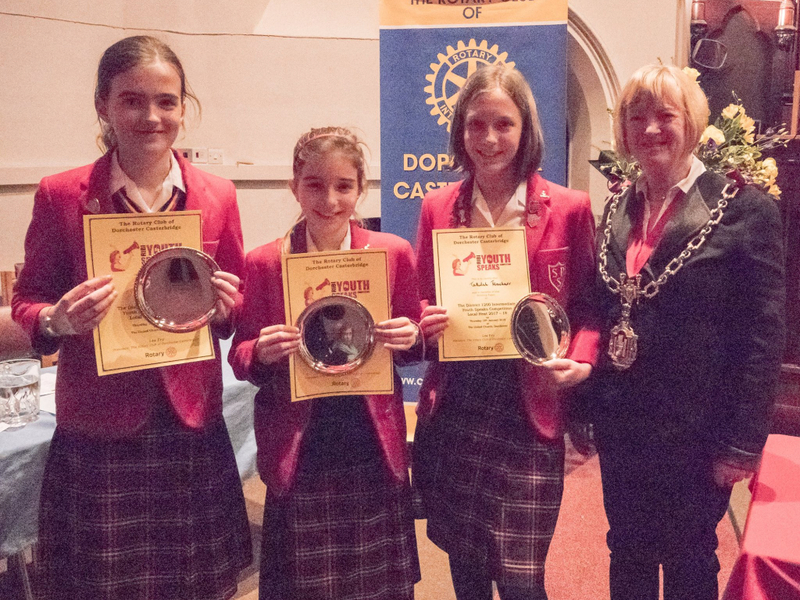 Five teams of pupils from Sunninghill used their voices to battle it out to represent Casterbridge Rotary Club in a public speaking and debating competition. Each team was made up of three 11 and 12 year old pupils who spoke on topics as diverse as saving sea turtles, zoos, what separates humans from the rest of the animal kingdom, families and Britain’s diet. The competition was the local heat of the RIBI Youth Speaks contest, with Casterbridge Rotary Club looking for the best team to go forward as the club’s representative in the next round of the contest. All the pupils were praised for their exceptional performances and judges Robert Potter, Tony Boyden and Richard Press had a tough time deciding which team to pick. Mayor of Dorchester, Cllr Susie Hosford, presented the trophies on the club’s behalf and said she really enjoyed her first Youth Speaks experience. The event took place at the United Church in Dorchester. The trophy for the winning school went to Sunninghill School and was received by Donna Fernley, the teacher who had instructed the teams prior to the event. A spokesman for the club said she ‘deserves many thanks and congratulations’. And for the first time this year, a new award was made for the Best Speaker of the evening. This was handed to Giselle Westwood, aged 11. After much deliberation by the judges the winning team was picked as Lily Barrett, Tallulah Taschner and Poppy Vera, who spoke on the Differences (or not!) of Humans and Animals. They will go forward to the next round, which will be held on Thursday, February 8 at Whitstone School, Shepton Mallet, starting at 5pm.